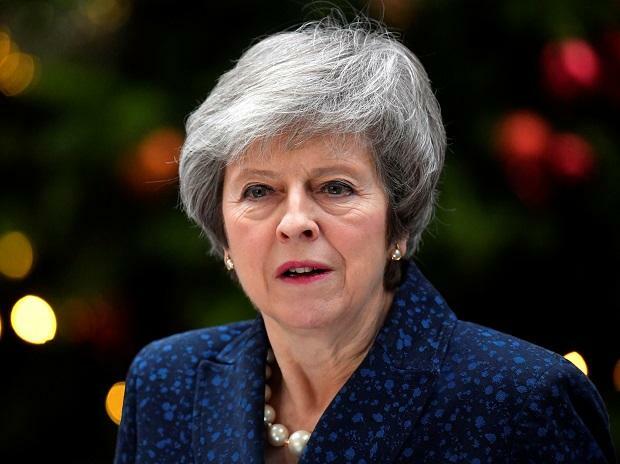 British Prime Minister Theresa May (pictured) called on Parliament to send a unified message to Brussels to rip open the Brexit agreement or watch chaos unfold as the UK splits away from the bloc without a deal. She made a bold pitch to win votes from her own Conservative Party, by siding with a hardline plan to scrap the most contentious part of the divorce accord she spent 18 months negotiating: the backstop plan for the Irish border. She also went further in her efforts to secure the backing of Tories, partially endorsing a compromise proposal the warring factions of the party had worked up between them. Her intervention was designed to ensure that the House of Commons takes a decisive step later on Tuesday and votes to say exactly what it wants to change in the Brexit deal. With just eight weeks left before the UK exits the bloc — and the existing agreement in tatters — May appealed to the Commons to give her some solid demands to put to Brussels. But it could go either way: by the end of Tuesday, May could have won a new mandate for negotiating with the EU, or she could have lost control of the Brexit process to Parliament. Unless May and the EU can agree on a plan -- and get it through the British and European parliaments -- the UK will tumble out of the bloc on March 29 without a deal, risking a recession in Britain and a hit to house prices and the pound. But their task remains formidable, with European officials unlikely to agree to new British demands. May spoke to European Commission President Jean-Claude Juncker before she addressed Parliament. A person familiar with the conversation said Juncker warned May that the bloc will not re-negotiate the Withdrawal Agreement -- even if the Commons calls for it in a vote. But May thinks the EU will have to reopen the exit accord if the bloc wants to avoid the disruption of a no-deal split.